You are currently browsing articles tagged timetables. These online Metro, RER, Trains, bus route & schedule tools will show you how to get from point A to point B. These route planners show required connections between train lines, travel times and ticket costs (some). For TGV intercity train route planners & ticket sales, see below. Paris Route Planner for Metro, Bus, RER, Trams (RATP.fr) – For central Paris and suburbs connected by RER train (Versailles, Roissy [CDG Airport], Marne la Vallee [Euro Disney], etc.). For a detailed example of using this Paris Metro Planner see CDG to Paris Metro Route Planner. 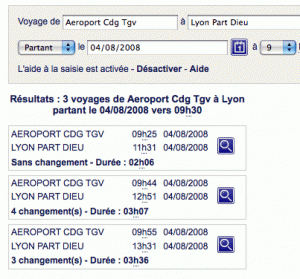 Paris Train Route & Schedule Finder (Transilien.com) – To and from major train stations in Paris to cities within surrounding Ile-de-France region. Major train stations in Paris are: Gare du Nord, Gare de Lyon, Gare de l’Est, Gare Montparnasse, Gare d’Austerlitz, Gare St. Lazare. 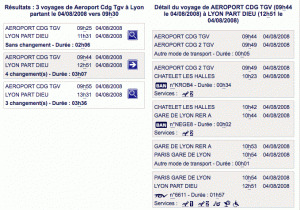 Detailed Itinerary Builder with fares (www.vianavigo.com – see extensive train route finder help documentation) – For all of central France (Paris + Ile-de-France) on all modes of public transportation. Includes fare prices. Below is a photo of the route planner tool at RATP.fr. Routes, Schedules, Ticket Sales for Paris – London Train (Eurostar.com) – See notes on finding cheap Eurostar fares. Routes, Schedules, Ticket Sales for Other Countries (TGV-Europe.com) – See notes on using TGV-Europe.com for ticket sales. Gares-en-mouvement.com has removed the itinerary builder from their site and are now asking visitors to use the individual train company sites for searching/building train itineraries. iDTGV – High-speed, often discount, Internet-sales-only branch of TGV train group. Limited destinations principally Paris, Lyon, Avignon, Bordeaux, Nice, Montpellier. The information below is now out-of-date, but will be kept for posterity. Start by choosing a station or Gare as your departure city or point. 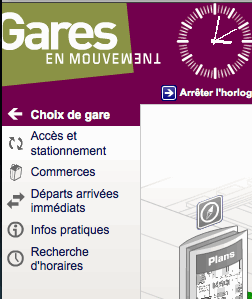 Then click on the link “Recherche d’horaires” (“Search Schedules”) on the left column of links. You’ll be presented with a search page with departure point pre-filled and the date of travel set to today. Enter a city after the “à“. You should see a list of stations appear below the text box after typing in the city name. Select your destination station from this list. Then set your travel date and time of departure. Finally, click Recherche (“Search”). (If you’re unsure of which destination station you should choose, enter just the city destination and the search tool will automatically select the largest station for the city). A maximum of 3 train itineraries will be returned with the option of seeing details about each itinerary. The results are ordered chronologically with the number of connections required (“changements”), and total travel time (“durée”). Clicking the blue magnifying glass button beside an itinerary will show details of that trip basically each train or connection required. You can search different starting stations by simply changing the text within the text box beside “Voyage de” (“Trip from”). As you type the name of a city, the site will offer you suggestions of stations which show up automatically below the text box. This helps prevent spelling mistakes and gives you choices of which stations you can select. For example, typing in “Paris” in the first text box will return a multitude of results whereupon you can use your keyboard’s down arrow to move down the list and press Enter to select the station you wish to depart from. When purchasing tickets, these sites will ask you where you want your tickets delivered. If your country is different than the region the website is covering, you’ll be redirected to the official reseller for your country of residence and you’ll have to start the ticket search process again.